SM - Introduced on 30 Novermber 2004 - Category SM oils are designed tp provide improved oxidation resistance, improved deposite protection, better wear protection, and better low temperature performance over the life of the oil. Some SM oils may also meet the latest ILSAC specification and/or qualify as Energy Conserving. They may be used where API Service Category SJ and SL earlier categories are recommended. 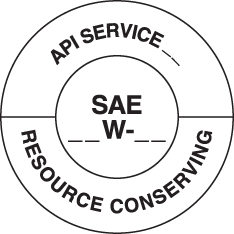 1994 and may be used when API Service Category CD is recommended. CF-2 – Severe-Duty Two-Stroke Cycle Diesel Engine Service (Obsolete) – Service typical of twostroke cycle diesel engines requiring highly effective control over cylinder and ring-face scuffing and deposits. Oils designed for this service have been in existence since 1994 and may be used when API Service Category CD-II is recommended. These oils do not necessarily meet the requirements of API CF or CF-4 unless they pass the test requirements for these categories. CH-4 Severe-Duty Diesel Engine Service – This service oils are suitable for high speed, fourstroke diesel engines designed to meet 1998 exhaust emission standards and are specifically compounded for use with diesel fuels ranging in sulfur content up to 0.5% weight. CH-4 oils are superior in performance to those meeting API CF-4 and API CG-4 and can effectively lubricate engines calling for those API Service Categories.